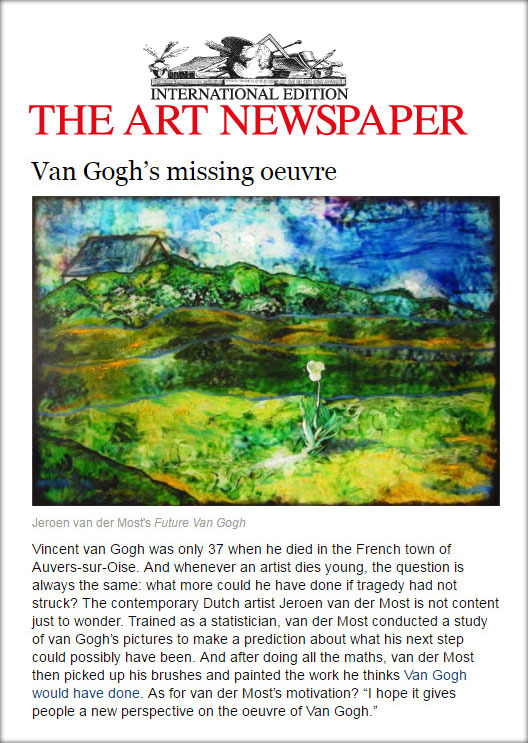 " THE ART NEWSPAPER "
Vincent Van Gogh was only 37 year old when he died in the French town of Auvers-sur-Oise. And whenever an artist dies young, the question is always the same: What more could he have done if tragedy had not struck? The contemporary Dutch artist Jeroen Van Der Most is not content just to wonder. Trained as statistician, Van Der Most conducted a study of Van Gogh's pictures to make a prediction about what his next step could possibly have been. ANd after doing all the maths, Van Der Most then picked up his brushes and painted the work he thinks Van Gogh would have done. As for Van Der Most's motivation? " I hope it gives people a new perspective on the oeuvre of Van Gogh"